The mode select switch allows you to select a Display or Non-display mode of the compass. The mode select is operated by the automatic glare-proof / non-glare proof switch on the inner mirror. Deviation between the magnetic north and "actual north" differs depending on the terrestrial location, therefore, an adjustment in magnetism is required. Since the magnetic condition differs according to the area where the vehicle will be used, it is necessary for each user to set the zone. (Refer to "Compass Zone Map"). The zone setting can be changed using the mode select switch of the inner mirror. Because each vehicle has its own magnetic field, calibration should be performed for each vehicle. This compass function is used when storing the record of the vehicle's magnetic field. 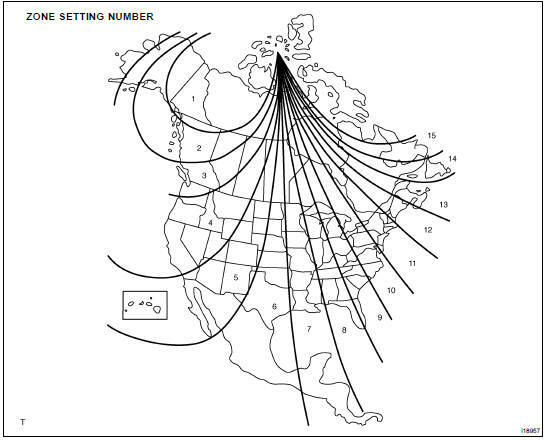 A compass could be magnetized during shipping by vessels or freight cars. Before delivery, therefore, make sure to perform calibration and ensure that calibration can be done. If it cannot be done (cannot complete in spite of driving round several times), it may be caused by magnetization. Demagnetize the vehicle using a demagnetizer and perform calibration again. (b) Check that the LED on the inner mirror is lit (green). (c) Check that the compass display indicates an azimuthal direction (N, NE, E, SE, S, SW, W, or NW) or "C". (d) Pressing the mode select switch on the inner mirror for 3 sec. or more erases the above mentioned display and activates the Non-display mode. Immediately after pressing the mode select switch, the LED goes off activating the Non-glare-proof mode. However, when the switch remains pressed, the LED is lit again after 3 sec. and the system enters the automatic glare-proof mode. Keep pressing the mode select switch for 3 sec. after selection of the compass display mode will activate the zone setting mode, showing a number (1-15) on the compass display. Pressing the mode select switch for 6 sec. from the normal mode will activate the zone setting mode, showing a numbar (1-15) on the compass display. HINT: In the initial status, "8" is displayed. The displayed number increases +1 every time the mode select switch is pressed. Referring to the map, check the number for the area where the vehicle will be used and set the zone number. Leave it untouched for several seconds after setting and check that the compass display shows an azimuthal direction (N, NE, E, SE, S, SW, W, or NW) or "C". 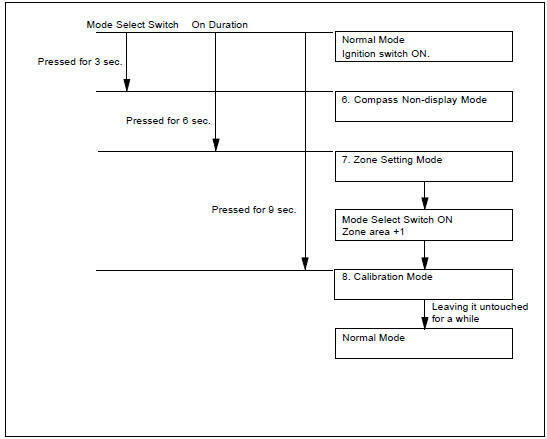 (a) After the set zone is displayed, if the switch remains pressed another 3 sec. will activate the calibration setting mode. (b) Pressing the switch for 9 sec. from the normal mode will also activate this mode. (c) Drive the vehicle at a slow speed of 8 km/h (5MPH) or less in the circular direction. (d) Driving round the circle 1 to 3 times will display the azimuthal direction on the display, completing the calibration. HINT: Once calibration is completed, it is not necessary to perform the above procedures unless the magnetic field strength is drastically changed. If this happens, the azimuthal display will be changed to "C".